Two designs for Apple iPhone docking stations have just surfaced in an Apple patent application, showing cradles that allow the iPhone to be docked and viewed in either horizontal or vertical orientation. 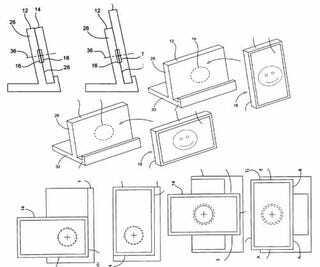 The patent application describes "Methods and apparatuses for docking a portable electronic device that has a planar like configuration and that operates in multiple orientations." The patent application even mentions the term "tablet PC." "The portable electronic device may correspond to a tablet, and the base may serve as a location for accessing the Internet or connecting to peripheral devices such as printers, fax machines, scanners, and the like.... In cases such as these the portable electronic device may correspond to a monitor, tablet PC..."
It works in a similar way to rotating LCD monitors, letting you dock and view the iPhone in whichever direction you prefer.